The Drunken City is a good title for a play. I want to know more. For instance, am I going to have to sit through a drunk play? Is this about a night of fun gone awry? Is this about my hometown? Yes except that it can be about any city. Last night I went on a 90 minute roller coaster ride with hills, loops and twists. 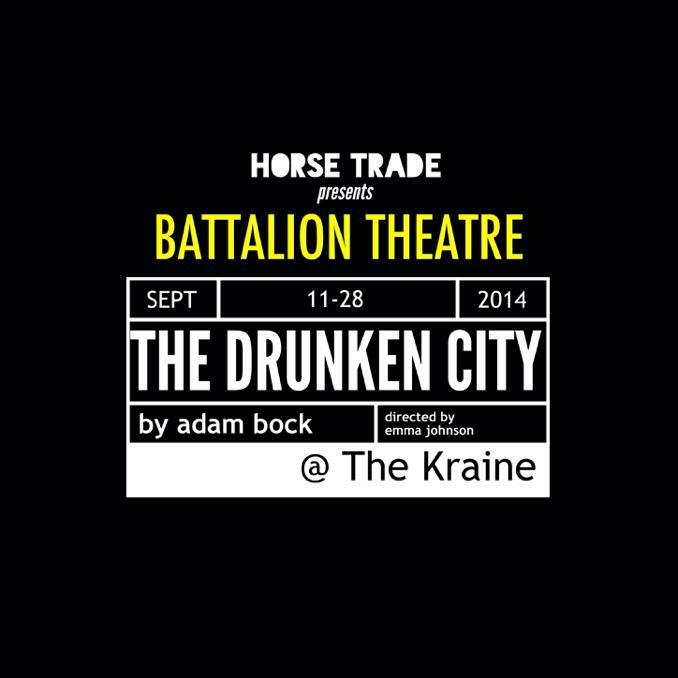 The Battalion Theatre Company’s production of Adam Bock’s The Drunken City starts off with music thumping, drinking, screeching, and dancing. I basically had an awesome flashback to my club days with my girlfriends. Then the story unfolds as a the bachelorette party does indeed go awry. Three drunk girls meet two drunk boys and all questions about love are answered in less than 24 hours. The cast is a strong ensemble, that clearly trust each other and enjoyed their shared stage time. I loved the use of the Basquiat-esque inspired art on the revolving flats, and it worked as an urban backdrop on the empty stage. They are running until 9/28 at The Kraine Theatre. Visit www.battaliontheatrecompany.com for more info.